Winter construction is complicated. First of all, factor in a northerly site characterized by permafrost. Next, add an isolated location dictating all construction materials arrive via airplane. 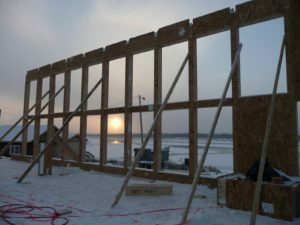 Consequently, it’s easy to understand how quickly the logistical complexities of cold-weather construction start to add up. Enter Kobayashi + Zedda Architects, an award-winning architectural firm based in Whitehorse, Yukon. The firm decided to make the Insulspan® Structural Insulated Panel (SIP) System a key component of its 3,500-square-foot building design. The building design was for the Vuntut National Park Visitor Information and Operations Centre in Old Crow. Old Crow is the only community located in the northern part of the Yukon Territory. For this reason, its new visitor and operations centre “… is an all-Insulspan SIP building,” says Tony Zedda. Because of its location, Zedda’s design called for Insulspan SIP floors, walls, and ceilings. Using Insulspan SIPs also ensured Zedda optimum quality control. This is because the factory-built-and-cut panels arrived on site via air transport. The prefabricated panels also eased construction in an area where skilled labour is limited – and expensive, says contractor Randy Shewen. Shewen is president of Building Industry Consultants Inc., which handled construction. Another benefit? With its shell quickly in place, construction workers immediately heated the building. Given the early-winter start of construction, this heating was a bonus says Shewen. The limited amount of construction waste was another plus. “When you’re flying in materials, you don’t want to pay for the 25% of materials that will be wasted on the site of a conventional stick build,” adds Zedda. 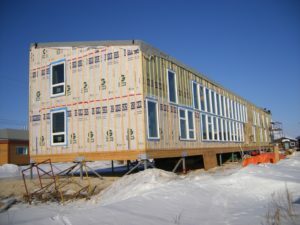 The Vuntut project was the first time Zedda and Shewen worked with Insulspan SIPs technology, and both say SIPs fit the environment. As a result, the men plan on using Insulspan again. 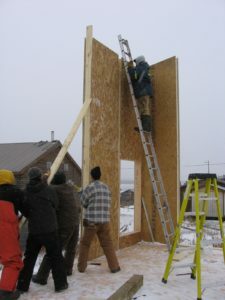 Read more about community buildings with SIPs and see photos here.